"What Do All the People Know" may be one of the best songs to come out of the early 80s synth-pop scene. Recorded by the Monroes on their self-titled debut in 1982, it seemed that the band was destined for greatness. Problems with the record label would change all of this and their one album remains their total discography. I recently purchased a copy of this album on Ebay. All songs are now loaded up and streaming on Vinyl Voyage Radio. Take a look (and listen) to the video below of "What Do All the People Know," played for you on glorious vinyl, just as music should be. Here is a video of The Monroes performing the song live on the Merv Griffin Show in 1982. It's Manic Monday on the Vinyl Voyage again. Nothing but 80s music all day long. Plus, newsclips, movie trailers and tv promos from that decade. Take a trip back in time on Vinyl Voyage radio. Funky, Feel Good Fridays..All 70s, All Day Long. Every Friday. 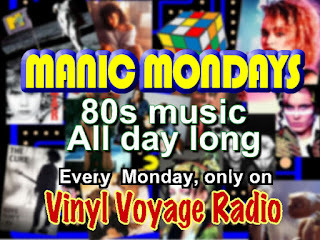 Start off the week with 80s music on "Manic Mondays." End it now with 70s. 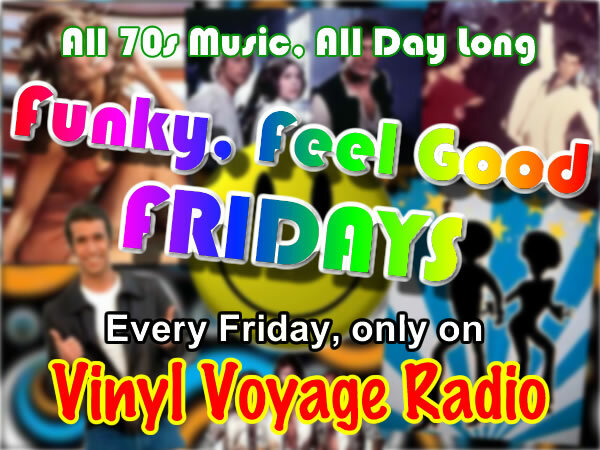 Starting tomorrow, every Friday will be devoted to the music of the 70s on a new feature: "Funky, Feel Good Fridays." The music will span the entire decade, plus take a trip back in time through news breaks, tv commercials and movie clips--all from the 1970s. 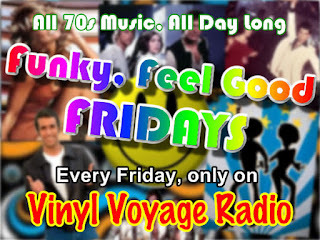 Funky, Feel Good Fridays---every Friday---only on Vinyl Voyage Radio. Where all music is played on glorious vinyl. Just as it was. And just as it should be. Adele was amazing at the Grammys the other night. What is so great about Adele is that beautiful, powerful voice. Did you notice that she was really the only performer without a set? The Foo Fighters had a garage. Taylor Swift had a porch. There was fire and trapeze antics with other performers. But not Adele. She didn't need any stage dressing. For modern music, the performance is sometimes more important than the substance. Therefore, the modern airwaves are clogged with music that is performed by not so talented singers who cover up their flaws with Autotune, bizarre outfits and swarms of dancers and energetic choreography. On stage, many hide behind lights, fire and scantily clad dancers. Madonna had her cheerleaders, for example. And what better way to hide a flaw than with a "wardrobe malfunction?" A few weeks ago, we lost a legend. Etta James was one of the rare singers who really knew how to sing, how to carry a lyric to its emotional potential. As a videographer, I used to film a lot of weddings. And through it all, I never grew tired of hearing "At Last." There was something magical about the way she sang. Same for Nina Simone. Dinah Washington as well. The first time I heard Dinah Washington's "This Bitter Earth," it almost moved me to tears. It's one of the reasons why I love Mavis Staples. Not too many vocalists have that ability. In terms of modern pop music, Adele definitely fits that bill. And so does Karin Bergquist. Karin Bergquist and her husband, Linford Detweiler, make up the core of the band Over the Rhine. They have been performing for over twenty years. And over the years, Bergquist has grown not only as a musician and songwriter, but also a singer. Like Dinah Washington, Etta James and Nina Simone, she has the ability to pack an emotional punch into every lyric delivered. She ranks up there with the best. I have written about Over the Rhine before on another blog. A song that appeared on their second album helped inspire a novel I am currently writing. I have seen them a couple of times here in Chicago, most recently last December at the Old Town School of Folk Music. I hope to make an Over the Rhine concert a yearly tradition. There is something magical about the way Bergquist sings. Hands down, she could run vocal circles around everyone who performed at the Grammys the other night. 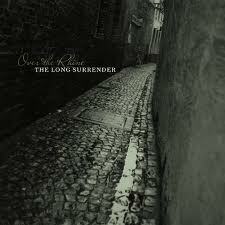 The Long Surrender is the band's most recent album, released last year. Produced by Joe Henry, the album contains the band's best work to date. Always heartfelt and often bittersweet, Karin and Linford weave a lyrical and musical tapestry that transcends everyday life and speaks to the soul. They have a certain authenticity in their music and lyrics. The emotions are real---and that's what distinguishes a band like Over the Rhine from just about anything played on the radio today. Or performed at the Grammys, for that matter. Recently, Karin and Linford celebrated their 15th wedding anniversary and performed a Valentine's Day show for a radio station in Cincinnati. One of the songs performed was "Infamous Love Song," a song written by Linford documenting the couple's story. This song, more than any other performed by the band over their twenty years or so, truly highlights Karin's vocal talent. Close your eyes while listening to the song and you will be transported to a smokey bar, a stiff drink resting on a scarred table while a singer, clutching a microphone, pours her heart and soul into a song that, for that one moment, is the most important thing happening in the room. This is a classic torch song and could have been the signature song of any in the previous generation of singers mentioned above. However, this is Karin's song. She embodies it in such a way that the song and her are one. If you liked Adele's performance of "Rolling in the Deep," then you'll love "Infamous Love Song" even more. Adele may have a beautiful and powerful voice. She may be a stunning performer. However, she is only 23 and lacks the experience of living. Karin and Linford channel their lives, with all of the beauty and scars, into their music. Karin and Linford couldn't have performed this song 20 years ago. And that's the thing about art and life. A true artist grows and matures. And this is the story of Over the Rhine. Each album they produce gets better. Deeper. More authentic. Imagine where Adele could be in 20 years. Perhaps she should listen to Over the Rhine, too. If you haven't heard Over the Rhine before, do yourself a favor and go to their website. Currently, they have the entire Long Surrender streaming on their online record player. I have a couple of their albums on vinyl so you can hear several songs here on the Vinyl Voyage. Most importantly, if you get a chance to see them live, do it. You will not be disappointed. In May, they will be performing an acoustic show at SPACE in Evanston, Illinois. Check out their current concert schedule. We are ready. The leg warmers are on. The hair is big and we're ready for some great 80s music. Not only we will feature 80s music from 6 am to 6 pm (ct), we will also have news breaks, tv promos, movie trailers and movie clips---all from the 80s. So take a a nostalgic trip back to the 80s on Vinyl Voyage Radio--where all music is played on glorious vinyl, just as it was and just as it should be. Hopefully, we won't have any technical difficulties today (unlike last week)...so tune in. February, so far, has been a good month for Vinyl Voyage Radio. And it's thanks to those of you who have tuned in. Over the last 30 days, we have now clocked over 200 hours of listening time. That's the first time we have gone to 200 hours in any given 30 day period over the last year. 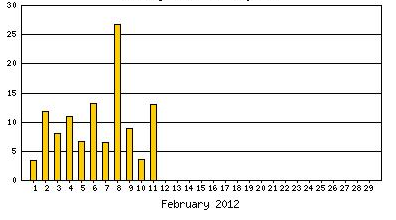 And on February 8th, there was over 24 hours of listening clocked! And February is shaping up to be a good month. 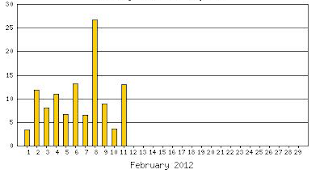 The total listening hours for just February is over 112 hours. In January, it was 162 hours, so we are set to go beyond that this month. Plus, only half of our listeners are coming from the United States. 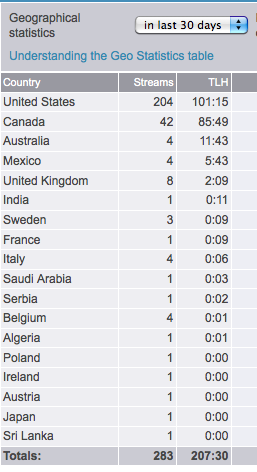 We have many listeners in Canada, Mexico, the United Kingdom, Belgium and Sweden as well. If you like Vinyl Voyage radio, please use the rating form our Live365 page. Like us on Facebook as well. And...continue to live your life at 33 rpm. Don't forget..Manic Mondays tomorrow. Nothing but 80s music. Gnarly. New K-Tel album. Thanks Ebay. It's been a couple of trying days here at Vinyl Voyage. We had to abort our first "Manic Monday" due to technical issues. And then today the internet went down for a couple of hours. However, I did receive a package in the mail. I often scan the listings on Ebay for K-Tel albums. Last week, I came across one that I didn't have and bought it for a couple of bucks. It's in pretty good shape. The album is from 1976 and is called "Pure Power." How can you go wrong with an album that features "Dream Weaver?" Or disco band The Sylvers along side with Alice Cooper? Heart and Diana Ross? That's the magic of K-Tel. It doesn't have to make sense. This album will soon be featured on Adventures in Vinyl. Ooops. Technical difficulties. No Manic Monday. Technology is great when it works. When it doesn't, we lose out on 80s music. My computer crashed today and therefore Manic Mondays will be on hold until next week. In the meantime, music is still streaming on Vinyl Voyage radio, with an eclectic selection of music spanning from the last 40 years or so---all played on glorious vinyl. You may be wondering how music can be playing if the computer crashed. Here is how the radio station works. The internet stream is provided by Live365. I can use their stream by hooking it to my computer at home. The files are stored on my computer and the station is run through an automated software system called SAM Broadcaster. I can set rotation rules and playlists and everything is done automatically. When I am at home and want to play "DJ," I can also do everything manually. In addition, I have hundreds of files stored on the server at Live365. If something happens to the live stream (like today), the other playlist goes into effect. And that is what happened. My computer must have crashed or something and was no longer delivering a stream---so Live365 took over. This is a good backup system. The music keeps going, regardless of what happens in my basement. Don't worry, there is still plenty of 80s music in the lineup. My formative years were spent deep in the 80s. Consequently, much of my record collection dates from that time. The Cure. Madonna. U2. Bruce Springsteen. The Police. Corey Hart. Duran Duran. INXS. I can go on. And on. So why not devote a day to that part of my collection? 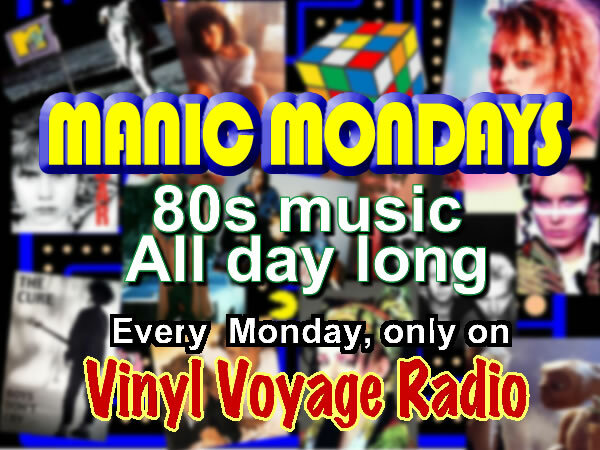 Every Monday, Vinyl Voyage Radio will go all 80s, all day long. We call it "Manic Mondays." And if you can sing that song, you know you want take a trip back to the "Me Decade." Throughout the day, we will have news clips, movie clips and other 80s related fun. Plus, of course, an eclectic mix of 80s music. All played on glorious vinyl. Just as it was. And just as it should be. 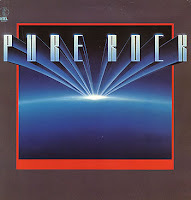 Get ready for K-Tel's "Pure Rock"
You have voted and it's official: K-Tel's Pure Rock is next on this month's Adventures in Vinyl. 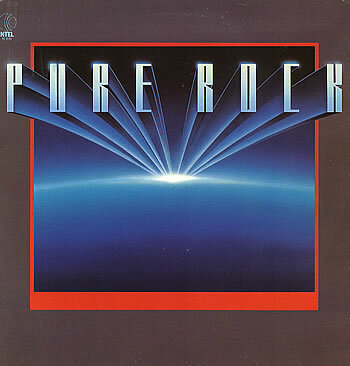 Pure Rock was released with little fanfare in 1981. This is an interesting album and very different from K-Tel's earlier compilations. Unlike other K-Tel albums, there are no tv or radio commercials associated with this record. One of the hallmarks of K-Tel in the 70s was was their ubiquitous presence on tv. In addition, the album is not overly edited. There are only 14 songs on the album as opposed to the usual 20 or so on most K-Tel albums in the 1970s. This was a change that K-Tel began implementing in the 1980s--less songs, but higher quality. And finally, this album has very little to do with 1981. The more popular K-Tel albums capitalized on hit songs ("20 Original Hits! 20 Original songs!") and contained songs from the year in which the album was released. On Pure Rock, only one song dates from 1981---Pat Benatar, "Hit Me With Your Best Shot." That song reached to #46 on the Billboard Year End Hot 100. Other than that, most of the other songs span the previous decade. The oldest song is "Long Train Runnin'" by the Doobie Brothers, released in 1973. That song made it to #41 on the year end chart for that year. Then there's Boston. Styx. Foghat. ZZTop. Eddie Money. Journey. The Steve Miller Band...and many, many more.